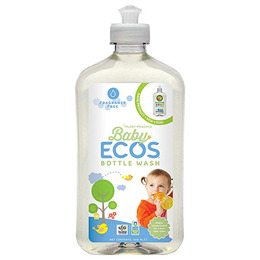 Each bottle of ECOS Baby Bottle Wash contains over 50 years of scientific passion and plant-powered goodness. Formulated with plant-based ingredients for washing baby bottles, bowls and utensils thoroughly. < 5% anionic surfactants, < 5% non-ionic surfactants, < 5% amphoteric surfactants, chelating agents, preservation agents phenoxyethanol and ethylhexylglycerin, pH adjuster. Squirt on sponge to use `as is`, or use bowl. Every 4L of water needs one squirt (or 5ml) of Baby Bottle Wash. Causes serious eye irritation. Wash thoroughly after handling. IF IN EYES: Rinse cautiously with water for several minutes. Remove contact lenses. if present and easy to do so. Continue rinsing. IF SWALLOWED: Seek medical advice. Always keep washing and cleaning products out of children`s reach. Below are reviews of ECOS Baby Bottle Wash - 500ml by bodykind customers. If you have tried this product we'd love to hear what you think so please leave a review.